The popularity of location-based social networks provide us with a new platform to understand users’ behavior and preferences based on their location histories. 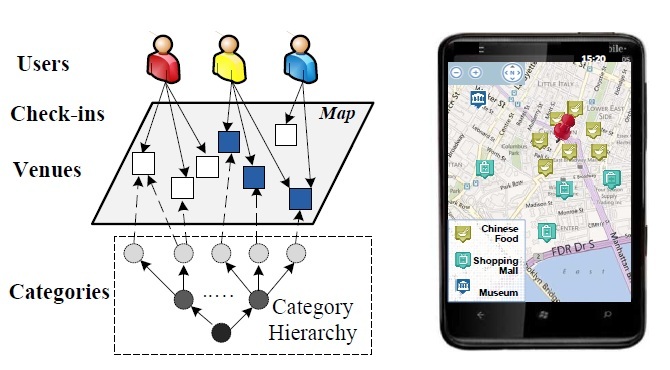 In this paper, we present a locationbased and preference-aware recommender system that offers a particular user a set of venues (such as restaurants and shopping malls) within a geospatial range with the consideration of both: 1) User personal preferences, which are automatically learned from her location history and 2) Social opinions, which are mined from the location histories of the local experts. This recommender system can facilitate people’s travel not only near their living areas but also to a city that is new to them. As a user can only visit a limited number of locations, the user-locations matrix is very sparse, leading to a big challenge to traditional collaborative filtering-based location recommender systems. The problem becomes even more challenging when people travel to a new city where they could have not visited. To this end, we propose a novel location recommender system, which consists of two main parts: offline modeling and online recommendation. The offline modeling part models each individual’s personal preferences with a weighted category hierarchy (WCH) and infers the expertise of each user in a city with respect to different category of locations according to their location histories using an iterative learning model. The online recommendation part selects candidate local experts in a user specified geospatial range that matches the user’s preferences using a preference-aware candidate selection algorithm and then infers a score of the candidate locations based on the opinions of the selected local experts. Finally, the top-k ranked locations are returned as the recommendations for the user. We evaluated our system with a large-scale real dataset collected from Foursquare. The results confirm that our method offers more effective recommendations than baselines, while having a good efficiency of providing location recommendations. The data can be download from here. Please cite this paper when using this dataset.